St. Joan of Arc in the French Quarter, New Orleans. All hail to the Maid of Orleans! Nearly 500 years after her death, St. Joan of Arc is vindicated and raised to the honors of the Altar, she who faithfully obeyed the will of God, even to her very death at the hands of wicked leaders in the Church. May she be an example to us to persevere in the fight for the goodness, truth and beauty of tradition, in the face of all oppositions and attack! The King of Heaven awaits our faithfulness! Jesus Christ, have mercy on us! Jesus Christ, graciously hear us! Our Heavenly Father, Who art God, have mercy on us! Son, Savior of the world, Who art God, have mercy on us! Holy Spirit, Who art God, have mercy on us! 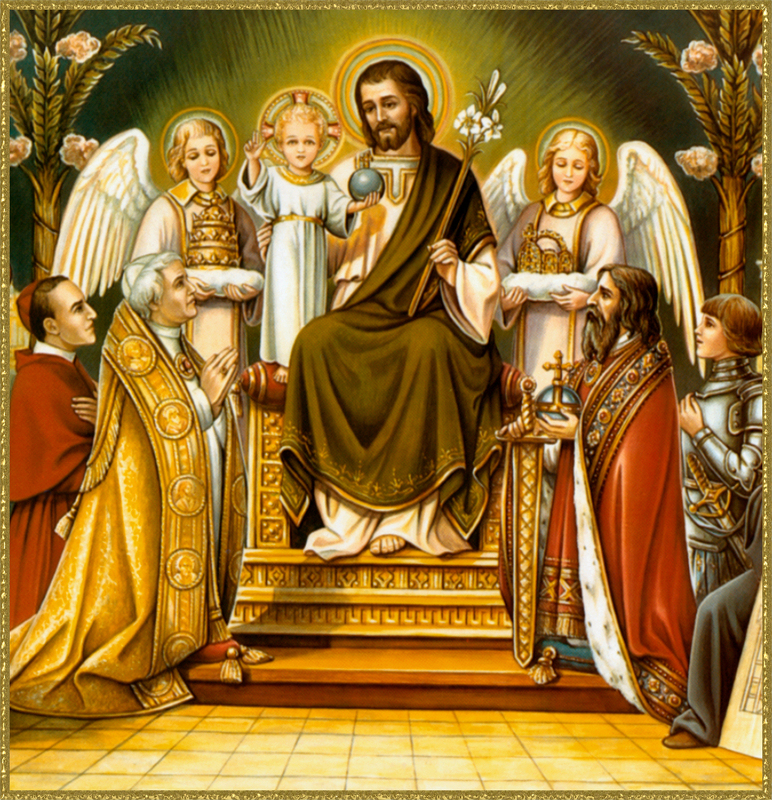 Holy Trinity, Who art God, have mercy on us! Holy Mary, virgin Mother of God, pray for us. Our Lady of the Assumption, principal patron of France, pray for us. Saint Michael the Archangel, patron and special protector of France, pray for us. Saint Catherine of Alexandria, virgin and Martyr, pray for us. Saint Margaret of Antioch, virgin and Martyr, pray for us. Saint Joan of Arc, chosen by God at Domremy, pray for us. Saint Joan of Arc, informed [of her mission] by Saint Michael, the Archangel and his Angels, pray for us. Saint Joan of Arc, compliant to the call of God, pray for us. Saint Joan of Arc, confidant [in] and submissive to her voices, pray for us. Saint Joan of Arc, model of family life and labor, pray for us. Saint Joan of Arc, faithfully devoted to Our Lady, pray for us. Saint Joan of Arc, who delighted in the Holy Eucharist, pray for us. Saint Joan of Arc, model of generosity in the service to God, pray for us. Saint Joan of Arc, example of faithfulness to the Divine vocation, pray for us. Saint Joan of Arc, model of union with God in action, pray for us. Saint Joan of Arc, virgin and soldier, pray for us. Saint Joan of Arc, model of courage and purity in the field [of battle], pray for us. Saint Joan of Arc, compassionate towards all who suffer, pray for us. 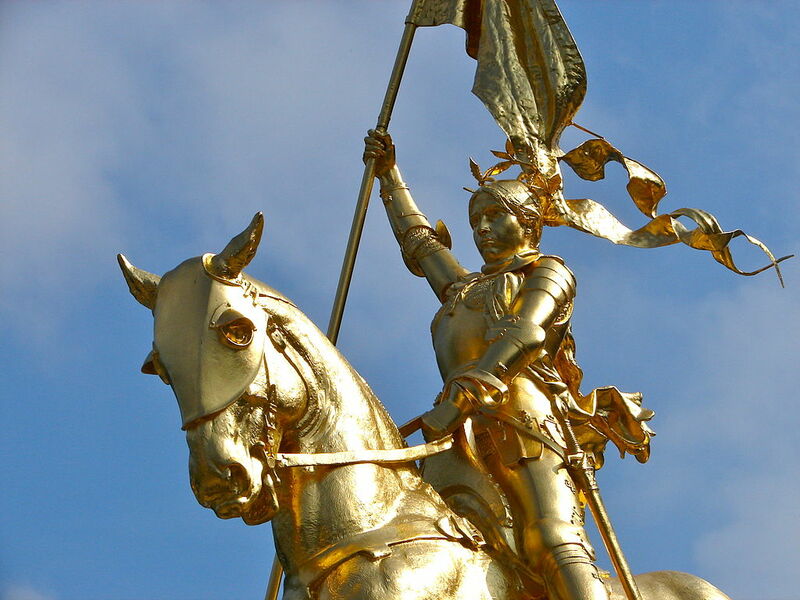 Saint Joan of Arc, the pride of Orleans, pray for us. Saint Joan of Arc, glory of Reims, pray for us. Saint Joan of Arc, liberator of the Country, pray for us. Saint Joan of Arc, abandoned and imprisoned at Compiegne, pray for us. Saint Joan of Arc, pure and patient in thy prison, pray for us. Saint Joan of Arc, heroic and valiant before thy judges, pray for us. Saint Joan of Arc, alone with God at the hour of torment, pray for us. Saint Joan of Arc, Martyr of Rouen, pray for us. 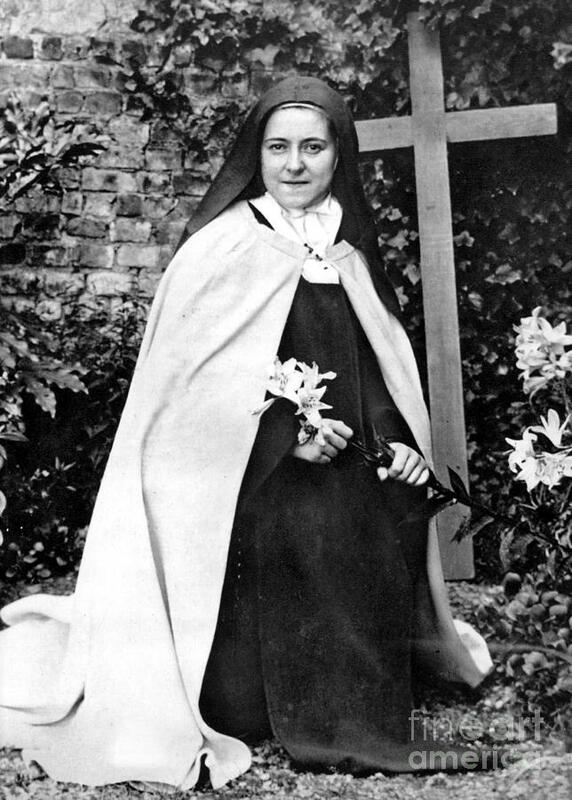 Saint Joan or Arc and Saint Therese of Lisieux patronesses of France, pray for us. All the Saints of France, intercede for us. ave mercy on us, Lord. Saint Joan of Arc, pray for us, that we may become worthy of the promises of Our Savior Jesus Christ. Oh God, Who hast raised up in an admirable manner, the virgin of Domremy, Saint Joan of Arc, for the defense of the faith and [our] country, by her intercession, we ask Thee that the Church [may] triumph against the assaults of her enemies and rejoice in lasting peace; through Jesus Christ Our Lord. Amen. St. Joan of Arc, my Heroine and Patroness, intercede for us and watch over our apostolate here at Damsel of the Faith. This entry was posted in St. Joan of Arc, Uncategorized and tagged St. Joan of Arc on May 30, 2017 by damselofthefaith. A Blessed Feast of the Ascension to all! 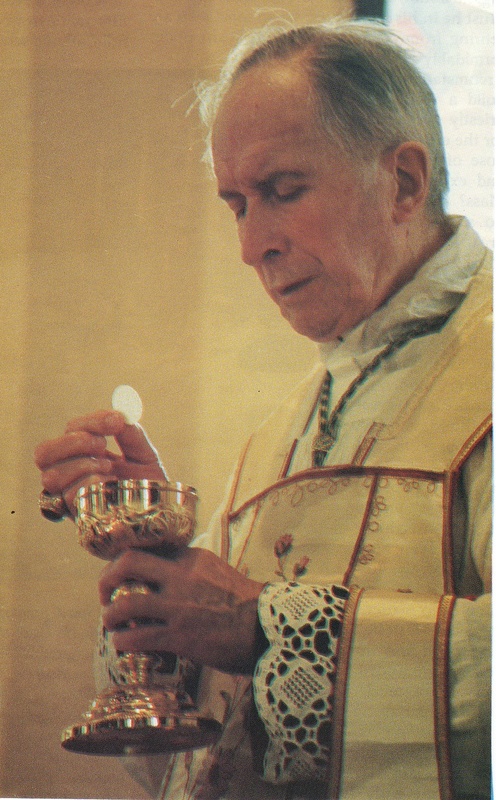 He left us but promised to forever remain with us in the Holy Catholic Church. This entry was posted in Uncategorized on May 25, 2017 by damselofthefaith. 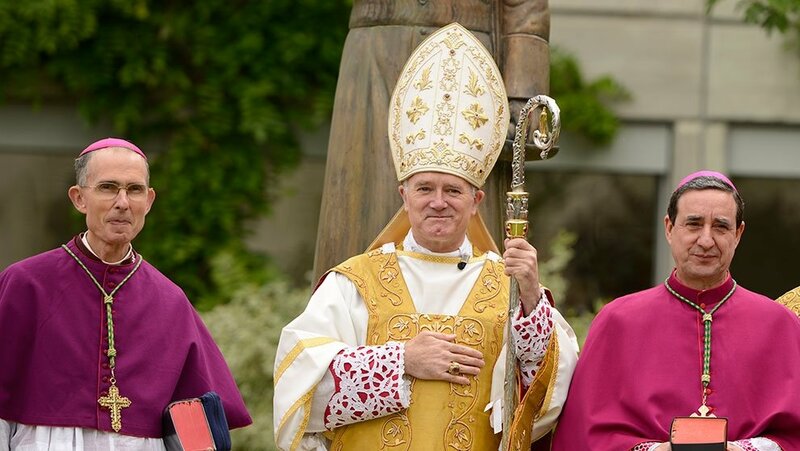 In Bishop Bernard Fellays’s latest interview, he gives us some insight into the Pope’s recognition of SSPX Marriages, as well as a general overview of the current Society relations with Rome. As always, a must read. The transcript follows. SSPX USA: Your Excellency, thank you very much for taking the time out of your very busy schedule to meet with us. If you don’t mind, we have a few questions that have been in the news recently that we hoped you might shed some light on. SSPX USA: The latest news from Rome, first of all, regarding the Society concerns provisions for our marriages. What does that mean for the Society and how will it affect us practically? Bishop Fellay: It’s a broad question. May I recall the background a bit? The background is that, for years, a kind of jurisprudence has been established by the official Church, by Rome, which claims that our marriages would be invalid. Of course, we have enough elements in Canon Law to prove that is not the case. But nevertheless, people who want to break – if I may say so — their marriage have an easy door with this stipulation. And so for years I’ve tried to see with Rome what can be done to block this unjust, unreal situation. Finally, after different ideas throughout the years – it’s almost 10 years that I have been discussing this – and it’s certainly an initiative of the Holy Father – came the idea of telling the bishops: why not recognize this situation as Catholic and hence give the delegation? That’s really the background. And what is very interesting also: it is stated that they speak about our marriages. And they say in that case, even if diocesan priests would be delegated for receiving the consent, nevertheless the Mass itself would be celebrated by a priest of the Society. So the fact that there is a clear statement that the priest will celebrate the Mass from the Society is once again a new step in the right direction, saying that these priests not only can but will say the Mass. And obviously in the right manner, so without any irregularity. So you have somewhere a certain contradiction in the text. It is obvious. It has to be understood in such a way that, first, Rome wants to state that we, in their eyes, are not yet completely in canonical order. So they want to make that statement. But despite that: “Treat them normally as if there would be no disorder.” That’s the interesting thing. Certainly, you can have different ways to look at this text; you can have a positive or a pessimistic way. But, looking at the Holy Father, looking at how Pope Francis deals with us, for a certain time, it is very clear that it is a benevolent step against us; not a trap, not a bad, hidden trick, or catch. No: it is a will that we are treated correctly at all levels. SSPX USA: Your Excellency, you spoke of possible contradictions in the text or even different ways of reading between the lines. Some of the faithful who attend Society Masses have perhaps read a different interpretation, expecting to now accept priests from the diocese to receive their vows. And some of them seem uncomfortable with the idea of a diocesan priest, for instance, coming to a SSPX chapel to receive their vows. What would you say to those who expect or think this provision of Rome is simply another obstacle for the faithful to get married by priests of the Society? 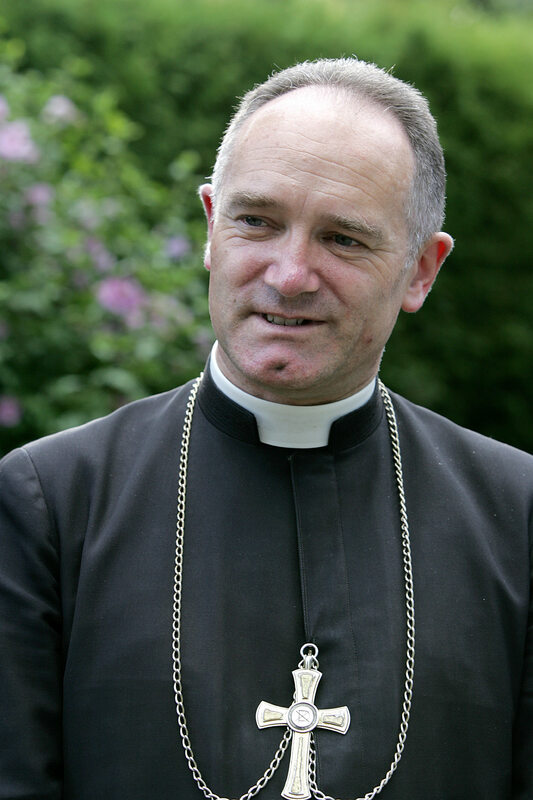 Bishop Fellay: I think when we go into the practical situation, it is difficult to see beforehand. 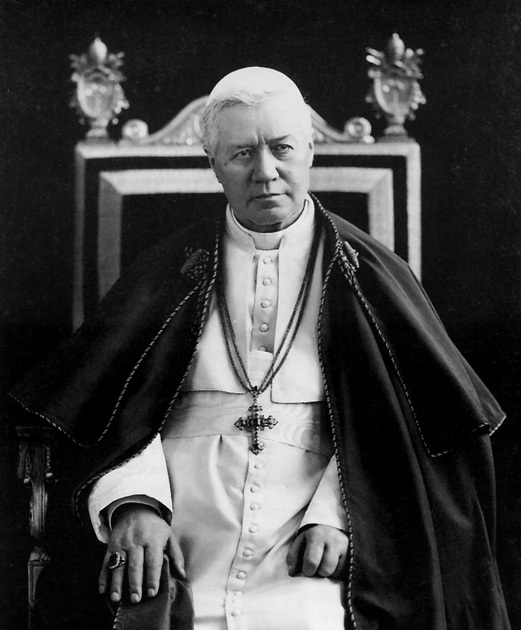 We will try to deal with the bishops; we will try to get the best out of the text. We already have examples right now of bishops, especially in Argentina, which is the country of the Pope, where the bishop has simply given the delegation to our priests. Period. And we expect that that will be the general situation. So, the correct interpretation of the text. This does not exclude a situation where, let’s say, a bishop will be stubborn and so on and will insist on imposing a priest. Then we will have to look into the concrete situation. Definitely, as it is a marriage of our faithful, they have a say. And that’s why I read in this way the text which speaks of “in an impossibility of Plan A, go to Plan B”, which is give directly the delegation to the priests of the Society. So, if there are cases where we feel uncomfortable, we have to say it. And it’s even in the text. Probably we will have here and there some difficulties, but they are not without a solution. SSPX USA: Since the document mentions the possibility of local ordinaries giving delegation directly to the Society, and you’ve mentioned possible examples that exist already, how will the priests of the Society go about trying to obtain that delegation? Is it up to individual priests, local priors, District Superiors, the General House? Is there any light you can shed on how, practically, that will play out? Bishop Fellay: We will indicate to the different Districts the path, the way of handling that case. You may have different situations. In general, as I say, we will try not to handle this case-by-case, but to get to general policies with the bishops. And this would mean that there would be a contact with the Superior of the District. SSPX USA: Speaking of general policies, in the document that was released from the General House, there was an indication that guidelines would be drawn up for the whole Society. Is it premature to comment on those guidelines or have discussions already occurred regarding those? Bishop Fellay: I think it’s too early. We have also to see how this text from Rome will be received locally. And we don’t yet have all the answers. But you can easily imagine that, with such a text, most of the bishops don’t bother as it is an opening towards us. And they will just grant it. SSPX USA: How would we deal with the question of marriage in places where, for instance, the bishops do not want to collaborate? Is there a risk of having certain countries or dioceses where bishops grant delegation and others don’t? Bishop Fellay: Strictly speaking, we could expect that. 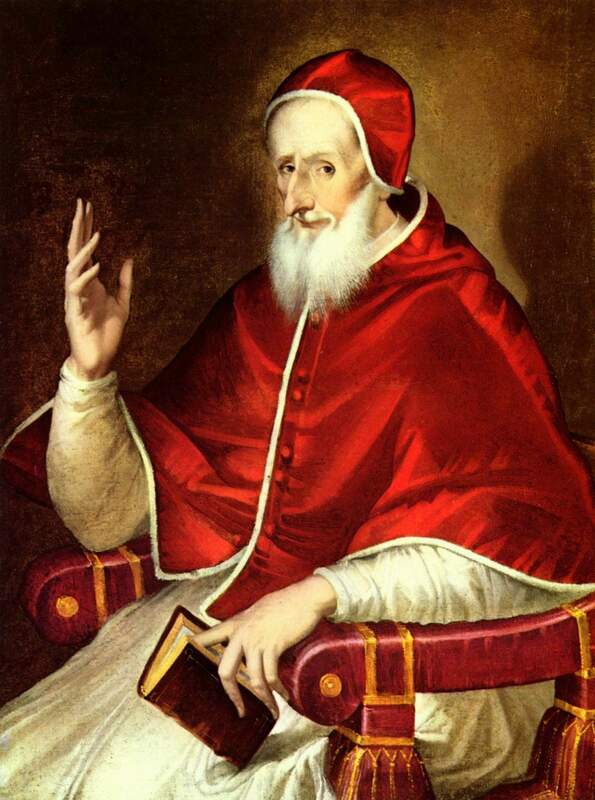 It’s possible, let’s say, that bishops would go against the disposition of the Pope. We know that. And I don’t fear that because we come back to the present situation, foreseen by Canon Law, which says that, if there is a grave difficulty, or in Latin, grave incommodum, the two future spouses can proceed. And they must have, for that situation, witnesses, and if a priest is available, the priest. SSPX USA: So in the event a local bishop would be opposed, is there some recourse to Rome to protect us or is that not in the case? Bishop Fellay: I would say it’s not necessary, but we probably will look into the question. And we may speak with Rome about it: would it be just to establish in such cases another policy, if I may say? When I spoke to the Pope about the present situation of bishops refusing, he said: “But I can give it!”It was really interesting. Let’s say, as an ultimate recourse, we know that, on the side of the Pope, there is a readiness. SSPX USA: This may seem like a practical question in light of the recent document, but where will these marriages from here on be registered? Will they simply be in the priories and chapels of the Society or in the local diocesan parishes or somewhere else? Bishop Fellay: If we follow the indication of the text itself, I think that the correct interpretation is that we continue our registration and we send the notification to the diocese. 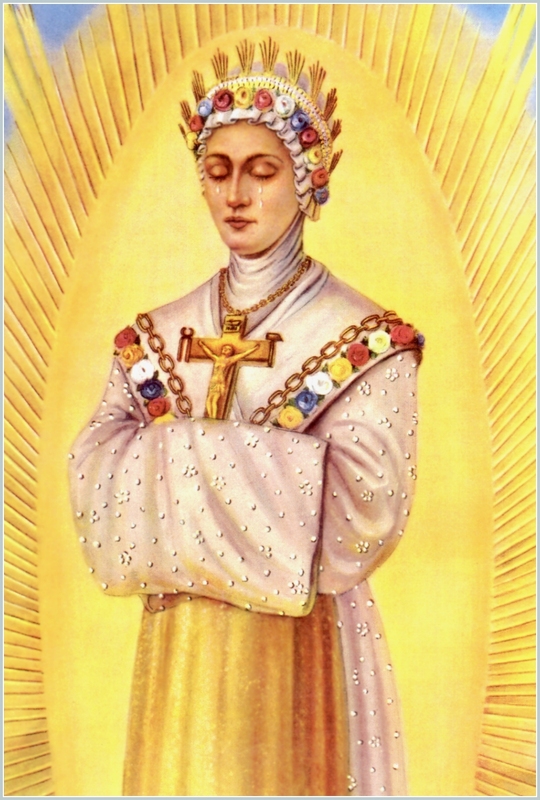 SSPX USA: Also, from the perspective of those who wish to be married, do you anticipate a kind of “test” for the spouses we have prepared for marriage? Would it not be strange for a priest who had no role in the training of the spouses to witness their vows and even have no idea whether they are properly prepared? 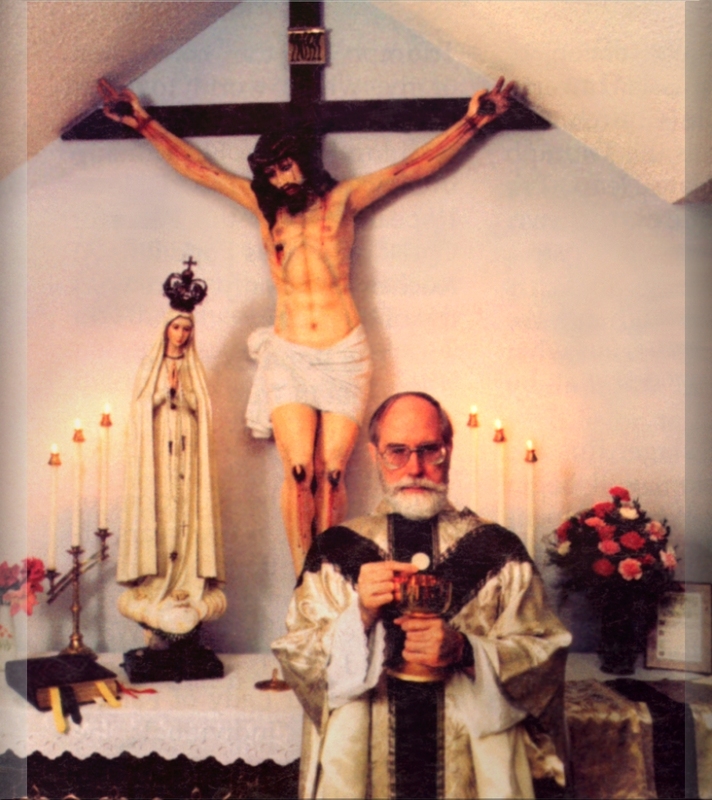 Bishop Fellay: Once again, I think the text foresees that we prepare, we make the tests, and the local priest is only there for the ceremony, like putting the stamp on a reality which is all ours. SSPX USA: You answered this a bit earlier, but perhaps you could expound on it. You seem to interpret this either as a step towards regularization or at least of good will from Rome rather than interpreting these gestures as a kind of trap to keep us from doing the work that we’ve already been doing. Can you comment any further on that dichotomy? Bishop Fellay: Yes, no problem. I think that this is not the first step which goes in that direction. I said that I’ve been discussing about this question for 10 years already. 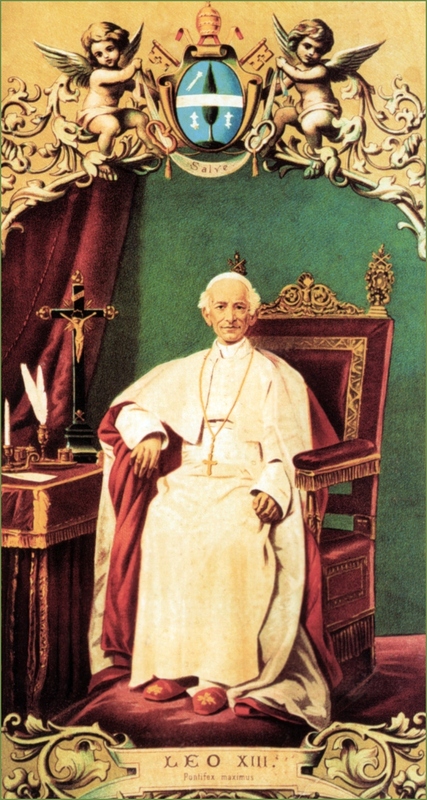 I speak about other problems which would request an intervention of Rome, of the highest authority; Catholic acts which we establish and that would be recognized by Rome. And I see that this is happening at diverse levels. The more we go, the more intense this is the common practice. Which means that, even though there are certain claims about us being irregular, more and more we are treated as if things would be just normal. In recent years, everybody has heard about the power of hearing confessions worldwide, everywhere. And being not only valid, but licit; that is, everybody can, without trouble of conscience, come to the priests of the Society. That’s an example. Another example is ordinations. Last year, I received a letter from Rome telling me: “You can freely ordain your priests without the permission of the local ordinary.” So if I can freely ordain, that means that the ordination is recognized by the Church, not just as valid but in order. If I can freely do it, it’s clear that this is just already recognized and accepted. So this is one more step in this acceptance that we are “normal Catholics” despite this underlying sense that we are still not completely in order. More and more, this is going on and it’s not the first step. 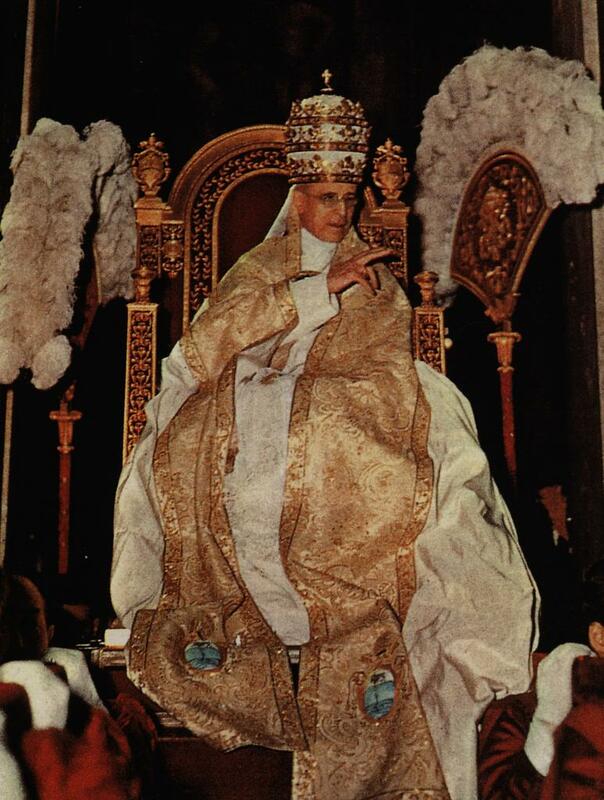 Frankly, I don’t see there any will to interfere or take over, but simply the recognition that what we do is Catholic. SSPX USA: To switch topics a little bit, though I suppose it’s indirectly related, there’s a little more than a year until the next General Chapter of the Society. Can you say anything about what preparations are underway and what that means for the Society; or is it perhaps too early? Bishop Fellay: No, I don’t think it’s too early. We can really talk about it. This Chapter is the one which will happen, provided everything goes forward or is still the way they are now. In any case, even if we are recognized before, it would imply a General Chapter according to our internal policies. So if it happens before, or at that time, in any case, it is the occasion for us to look into our faithfulness to our statutes, how accurate we accomplish them, what the failures are, what are the points are that need improvement, what the new questions are, and new problems. I guess that, with this new possible recognition by Rome, this will, when it happens, raise quite a number of new questions, of new situations. We certainly already reflect on them now, but we’ll have to put them into guidelines or policies for the whole Society. In any case, I think it will be an important Chapter and we are preparing, definitely. One year is not too long before to prepare it. SSPX USA: Perhaps speaking even more generally, can you say how and where is the Society growing most around the world? Are there places in particular that perhaps strike you as unique or particularly impressive? Bishop Fellay: What I see, in general, is a more or less constant growth, not too spectacular. Here and then, a group would just join us as a group, but that is really rare. It’s more or less individuals who come, who join, one family here or there. But this is universal in all the countries where we are settled; in all six continents you find that. Some places know greater or more intense growth: countries like the United States and some places in Africa have that, yes. But there are variations from one country to the other. So I cannot say for sure that for 10 years you really have one which is increasing more than another. The whole Society is still growing and I say, the more we grow, the more we have a problem of not having enough priests to cope with all the needs. 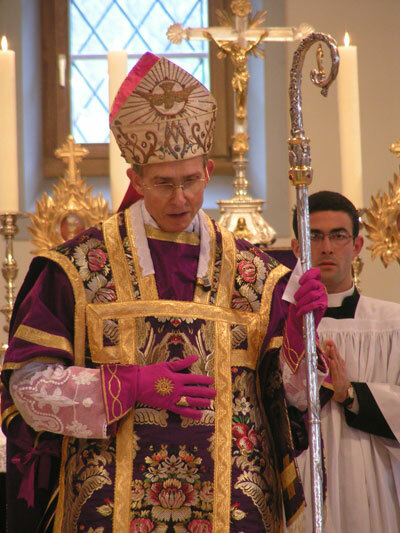 SSPX USA: Speaking of priests, what is the trend of priests coming from either dioceses or religious congregations, perhaps showing interest in the Society? Has it increased or decreased since Pope Francis? Maybe you can speak to their motives and why they choose the Society out of a number of options. Bishop Fellay: Yes, it seems to me that there’s not much change before and after the election of Pope Francis. I think it is deeper trend than just one person being in charge. There are priests, indeed, who approach us. They approach us to become a member but many of them don’t necessarily want to become a member. But they want to be friends, they want to learn from us: the sacred liturgy, on one hand, but more the doctrine. Once I was in front of a group of priest friends in Italy—it was about two years ago—and I asked them, about 30 priests: What do you expect from us? And I was almost certain that they would say, “Well, teach us how to say the Mass.” That was not the answer. The answer is: the doctrine. That’s what they expect. And it’s deeper, of course: without doctrine, which explains the Mass, the Mass may be beautiful and so on, but what makes it solid is the doctrine which is expressed, which is coming out of the Mass. And if you have a good and solid knowledge of this theology, it makes the liturgy even more necessary, I may say. And that’s what you see a little bit everywhere. 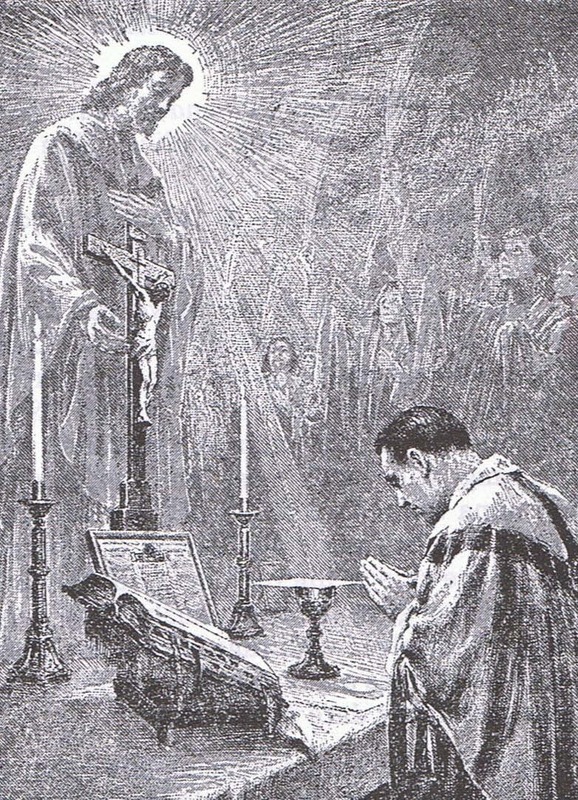 I see priests who approach us, but not just for the Mass: for much more! They want to learn Tradition. Many of them, when they discover the Mass, are frustrated. They feel cheated. And they say: “These are treasurers, our treasures, and they were hidden from us!” But they don’t remember that level of frustration; they really enjoy Tradition deeply and they want to live it. SSPX USA: Your Excellency, speaking of another more universal question, Amoris Laetitia has generated a tremendous amount of confusion and controversy since it was released last year. On the one hand, one could say it’s encouraging to see some wake up to the crisis in the Church; on the the other hand, the pastoral results of that document are really devastating. There are even some who claim the Society has been too soft in their critique of Amoris Laetitia. What are your thoughts about this document and the controversy it’s engendered? Bishop Fellay: At the time, I wrote to Pope Francis, and we prepared a text to wake up the cardinals, a letter from our three bishops. 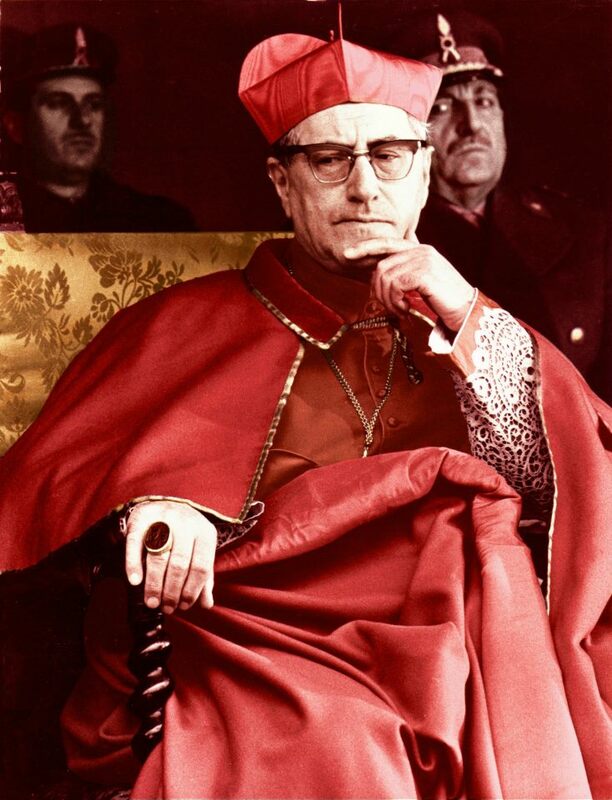 But, I will not say “unfortunately”–that would not be the right word—but four cardinals took the initiative just before we were about to send the letter. That’s why there was not much noise about it because it was already done. So our letter just remains in a drawer. In fact, we are certainly doing all that we can with those who raise their voice. I think it is important that people notice that we are no longer the only ones who complain, who denounce, who attack poor situations which are harming souls. It could be one of the reasons why, here and there, I would not talk immediately, letting their voice appear and not mixing mine with theirs. Because usually when we do that, they are disqualified because this tendency of disqualifying us in the modern Church is still very present. And so, letting their voice be heard, for the whole Church, is probably better. And everybody anyway knows what we think and what our positions are. It has not changed and everybody knows that. So while, and as long as there are voices in the Church who talk in the right direction, to say that one day or another, I would have spoken more softly, does not change anything in the big picture, in the big fight which is still there. That’s very, very clear. And it absolutely does not mean that we would, by politics, in order not to jeopardize a possible agreement—which is not the correct word—or canonical recognition, lower our voice is simply not true. If someone would be careful and look at all I write and say, they would say that I just continue. We are still the same. And I insist in Rome to say we are like this and we are not going to change. We may be a little bit less controversial in attacking the persons. But our reason would not be just a personal gain. What we look for is the most efficient way to have a benefice for the whole Church. Sometimes you gain more by giving a simple argument than by barking it. You have to look at the cases. We are still in a fight, we know that, and it’s definitely not over. It’s not just for the pleasure of fighting, but we belong to the militant Church. SSPX USA: Perhaps in conclusion, a simpler question: you’re here in St. Mary’s, KS, for confirmations. St. Mary’s is obviously the Society’s biggest parish and school in America. What are your impressions or thoughts you might share on St. Mary’s? Bishop Fellay: I admire the work of Divine Providence in this place which was sanctified just before us by the Jesuits. It was the scholasticate of the Jesuits. 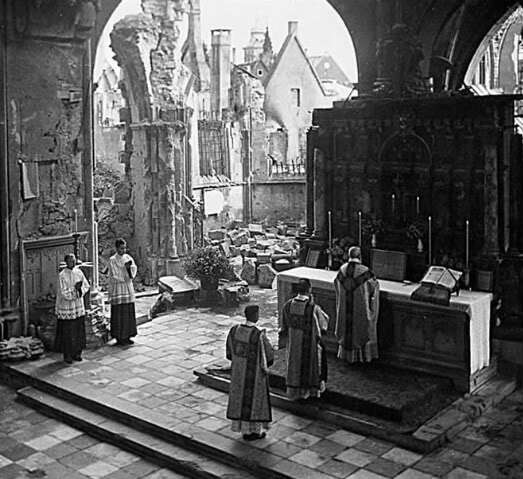 In the church, which is no longer there, which was burnt, we know that over 1,000 priests have been ordained. We know it’s not only a very holy place, but a very priestly place. 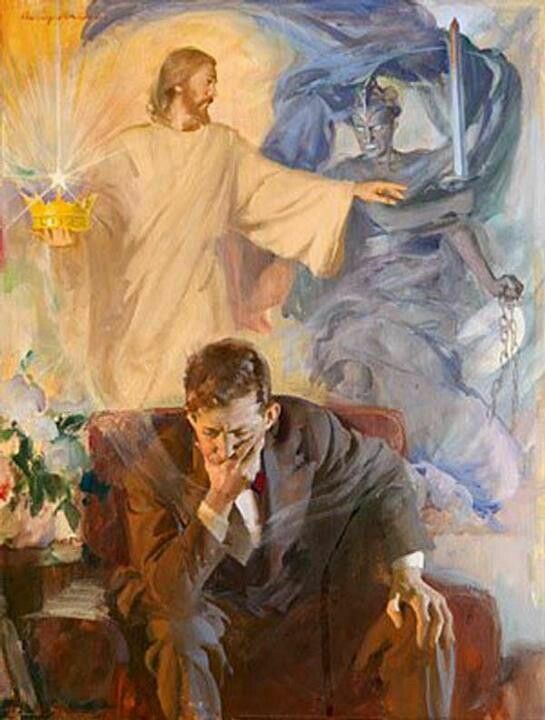 And as the first scope of the Society is the priesthood, it’s a good reminder. And I may say certainly we are harvesting. We are trying to sow the seed but we are more harvesting from the work of previous good workers in the field of the Lord. We certainly admire and thank God for these beautiful fruits of the traditional attitude, which was everywhere before. This entry was posted in Church crisis, SSPX and tagged SSPX on May 22, 2017 by damselofthefaith. Scholars and historians have debated the subject and many people have wondered why a sentence in Scriptures was dedicated to a seemingly unimportant detail about the burial cloth of Christ. To grasp the meaning of this seeming oddity, we need to have an understanding of the Hebrew traditions of that time. Hebrew dining tradition centered around the servent and his master. Naturally, the servent served his master. The custom was that if the master was finished, the napkin would be tossed in a wad on the table, signifying that the master had finished eating. If the master left the table but was returning, the master would fold the napkin neatly. Jesus Christ, the true Master, was telling us that He is returning from the dead, just as he said. This entry was posted in Resurrection of Our Lord, Uncategorized and tagged Resurrection of Our Lord on May 18, 2017 by damselofthefaith. 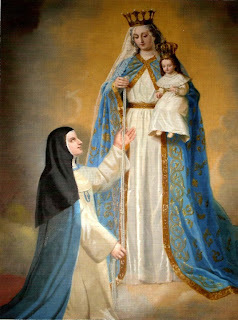 100 years since the Virgin proclaimed the greatness of our Faith and the importance of her Angelic Salutation of the Rosary. 100 years since she warned us to return to her Son in repentance so as to avoid the chastisements that would come, as a result of failing to consecrate Russia to Her Immaculate Heart. 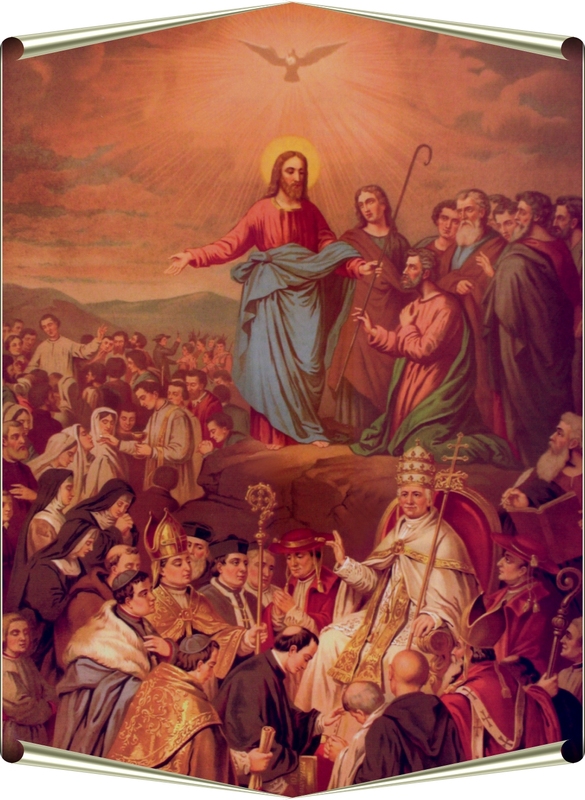 To this day, they have failed to heed her warning and have reaped the results – two world wars, Communism with the host of evils that have resulted, and persecution of the Church by the Modernists that have attacked every aspect of the Church. To describe this day in a Dickensonian manner: “It was the most beautiful of anniversaries and the most dire of anniversaries”. What a true honor it should be for every Catholic to witness such a milestone in the history of the Church and the world. Certainly we should give this day great honor and celebrate with appropriate jubilation. However, we must not imitate the example of those clergy and laymen who wish to confine Fatima to a status of irrelevancy and unimportance. 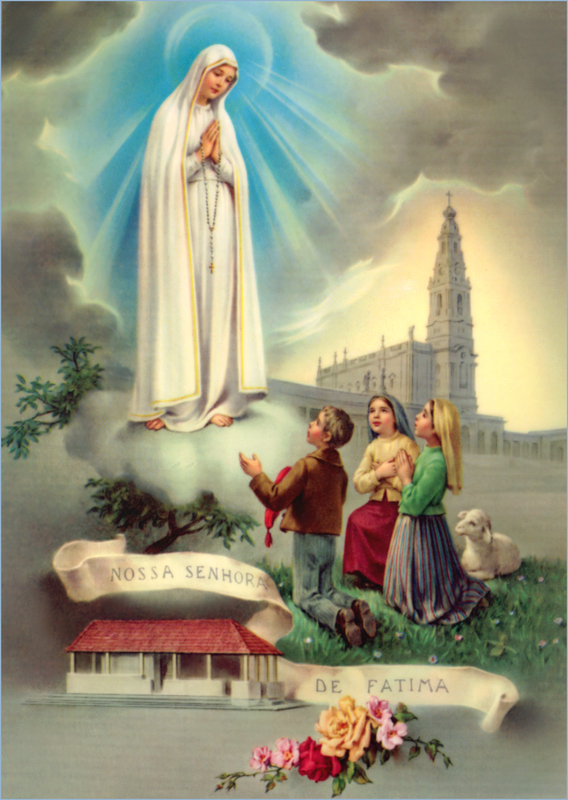 At Fatima, Our Lady has given us the Message specifically meant for our times. Catholics living in our age are called to foster a devotion to the Immaculate Heart of Mary and to live a life of sacrifice, like she asked for at Fatima. In doing our part, hopefully we can help to hasten the coming peace, when the Pope and Bishops finally open Our Lady and consecrate Russia to Her Immaculate Heart. Our sacrifice need not be unpleasant, rather it should be a cross of joy! If not taken with love, it is no sacrifice at all. Although we may have much to suffer, Our Lady has assured us that “the grace of God will be your comfort”. We will save so many souls by our sacrifices! 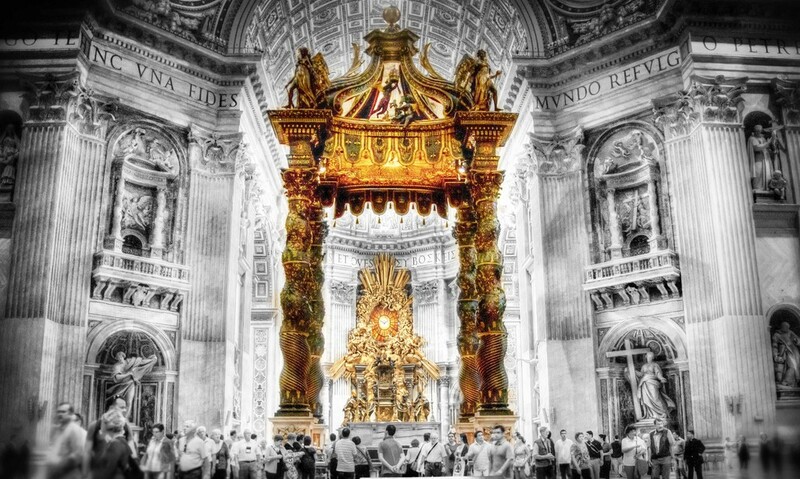 The great sacrifice in our day is definitely the fact that faithful Catholics are so thoroughly spurned by not only the world, but also most of the hierarchy in the Church. We also hear constantly of wars and rumors of wars, as Our Lady predicted. Finally, the Blessed Mother could not be accurate in stating that Russia will spread her errors across the entire world. This exactly has happened. Communism is not primarily based off of physical protection, but atheistic materialism. Who could not deny that the entire West has fallen prey to this evil? Just consider, for example, the candidate France has chosen to lead them. Alas, the Eldest Daughter of the Church! Despite this grave situation, we must nevertheless possess a great Hope. Our Lady is our last hope in these times. 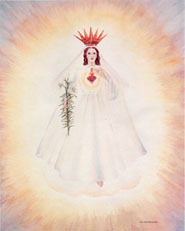 The triumph of the Immaculate Heart is fast approaching! We must remain faithful to our 5 decades daily and our First Saturday devotion. Be sure to ask your traditional pastor for permission to fulfill the First Saturday conditions on Sunday if your chapel does not offer Mass on Saturday or if you are unable to attend on this day. Our Lord and Our Lady have permitted this so that all Catholics, even in these difficult times, may practice this devotion. We can save so many souls if we just make use of the means God gives us. Above all, we must beg Heaven for the Holy Father to finally consecrate Russia with the world’s bishops. But let us be assured; Tradition continues to grow and the great restoration is approaching! We both wish to express our appreciation to our pastor for the beautiful Rosary procession he has planned for tomorrow in commemoration of this anniversary. We also commend those in Tradition who will be appropriately acknowledging the height of this day. I wish to highlight one particular example for the edification of our readers. On this day, Bp. Bernard Fellay will be traveling to the Philippines to consecrate a new church for St. Bernard’s Noviciate in Iloilo. After 15 years of celebrating Mass in a garage, the Noviciate has built a magnificently beautiful building to honor the Blessed Sacrament. A couple of photos will follow this post. Woe to the serpent and rescue to man. Measure Thine aid by the depth of our need. 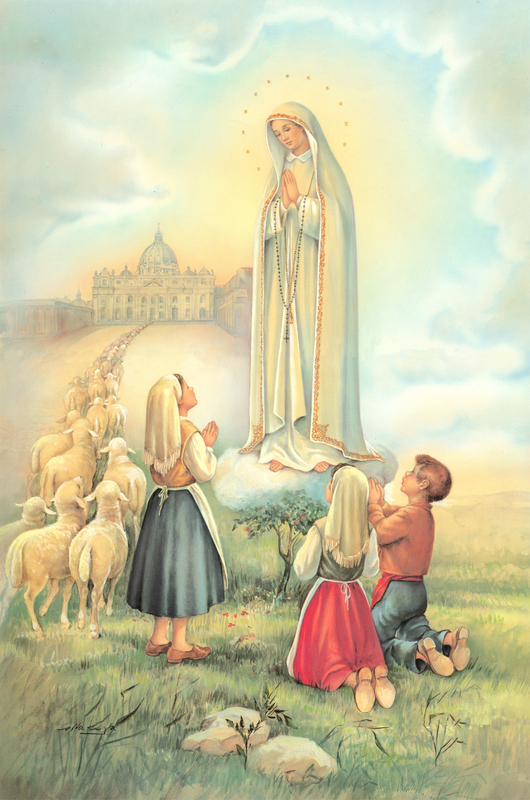 Our Lady of the Holy Rosary of Fatima, ora pro nobis! This entry was posted in 100th Centennial of Fatima, Our Lady, Uncategorized and tagged Fatima, Our Lady on May 13, 2017 by damselofthefaith. Recorded in the life of St. Vincent is a miracle of conversion and salvation, worked through the powerful intercession of a great saint. I think this little story is not very known so I encourage you all to reflect upon it and share it. God calls the sinner back to him, sometimes in subtle ways and sometimes with visible signs. St. Vincent read the answer, and without delay the happy woman made her confession; in half an hour afterwards her soul took its flight to heaven. Oh! happy sinner! This entry was posted in Letter from the Trinity and tagged Letter from the Trinity on May 9, 2017 by damselofthefaith.